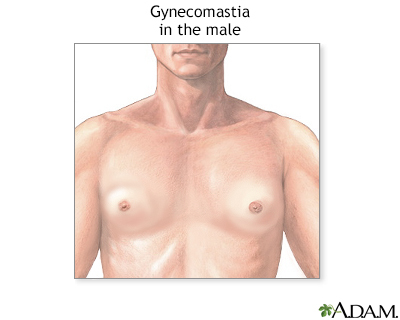 Gynecomastia is the development of prominent breast tissue in the male. The condition can develop during puberty and sometimes resolve on its own. Other causes of gynecomastia include exposure to estrogens, androgens (often taken secretly for body building), marijuana, and some medications. Rare causes include tumors, genetic defects, and chronic liver disease. Reviewed By: Robert Hurd, MD, Professor of Endocrinology and Health Care Ethics, Xavier University, Cincinnati, OH. Review provided by VeriMed Healthcare Network. Also reviewed by David Zieve, MD, MHA, Isla Ogilvie, PhD, and the A.D.A.M. Editorial team.